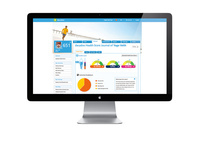 LONDON and ZURICH, JULY 17, 2013 — McCann Health, London, and dacadoo ag, Zurich, have formed a strategic partnership focused on expanding the global healthcare and lifestyle marketing potential of the dacadoo Health Score Platform. The dacadoo Health Score is a proprietary numerical scale that allows users to capture their health and fitness status and track it in real time through their smartphones and other digital devices. dacadoo, the 3-year-old company set up by Peter Ohnemus, whose earlier successful ventures included Sybase and Asset4, is a specialist in connected health, having developed its own mobile optimised health tracking and scoring platform from a lifestyle, wellness and chronic disease management perspective. The dacadoo Health Score is based on several tens of millions of person-years of clinical data and incorporates many of the well-known and validated cardio/cerebrovascular risk studies and quality-of-life assessment tools. dacadoo is fully integrated with smartphones, can connect to external wireless devices (e.g. weight scales, pedometers etc.) and is also capable of importing workouts from other fitness tracking devices. dacadoo’s President and CEO, Peter Ohnemus said, “Changing behaviours represents the single biggest opportunity to improve health outcomes. By combining technology with known principles from the other industries as well as with group dynamics from social networks, we strongly believe that the dacadoo Health Score Platform can facilitate behavioural change and motivate users to adopt a healthier lifestyle”. Comprising the world’s most connected health and wellness experts, McCann Health (www.mccannhealth.com) is the most awarded professional and consumer health communications network with the largest international expertise spanning 35 countries and 57 offices. McCann Health’s global network includes McCann HumanCare, McCann Healthcare, McCann Regan Campbell Ward, McCann Torre Lazur, McCann Complete Medical, the leading worldwide medical communications practice, and Double Helix, an international healthcare consultancy focused on working with clients on strategic market research and market access issues. McCann Health is a part of McCann Worldgroup, the largest marketing communications agency network in the world, and is a leading healthcare agency network owned by Interpublic Group [NYSE: IPG]. dacadoo (www.dacadoo.com) has developed an easy-to-use, wireless, secure and fun way to manage your personal health from a lifestyle, wellness and chronic disease perspective called the dacadoo Health Platform. The platform calculates your personal dacadoo Health Score, a number from 1 (poor) to 1’000 (excellent). The dacadoo Health Score is the key indicator of your current health status. By integrating gaming and social networking principles, dacadoo motivates you to be active in an easy way by automatically tracking and comparing your personal health, fitness, lifestyle and sport. The dacadoo Health Score has been developed by dacadoo in collaboration with a professor and former long-term scientist at MIT in Boston. The score is based on on several tens of millions of person-years of clinical data and incorporates many of the well-known cardio and cerebrovascular risk studies in addition to dacadoo’s quality of life questionnaires. The company is currently engaging with strategic partners from the telecommunications, healthcare, fitness, media and health insurance industries to serve both corporate and private clients. dacadoo has offices in Zurich, Switzerland and in San Francisco, USA.